Imagine looking up at the ceiling in a home, office, or even a school and seeing a cloud-filled sky. It’s a trend that’s becoming more popular thanks to decorative fluorescent light covers turning those plain white colored light panels into a variety of different images. Harsh fluorescent lights can now be given the appearance of everything from stained glass and ornamental iron to sky murals and even decorative glass prints. Did you know that long-term exposure to unfiltered fluorescent light can be detrimental to your health? Many people complain of eyestrain and persistent headaches when working under or near unfiltered fluorescent light. 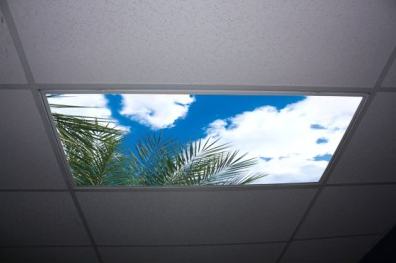 One simple and effective way to combat those negative side effects is by installing fluorescent light covers. Diffuser Specialist offers a wide range of extruded acrylic wraparound replacement lenses that are designed to restore a worn out old, yellowed, or broken wrap lens. Fluorescent lighting fixtures are designed for specific light distribution and the condition of the fluorescent light diffuser being used affects their performance directly. By replacing wraparound diffusers with our extruded replacement, you can restore the efficiency, appearance, and performance of the fixture. Our Wrap Lenses come in lengths up to 8 feet and are designed for 1, 2, and 4 light fixtures. We even have wraps specifically for under counter fixtures. Vapor Tights – Vapor Tight plastic light diffuser enclosures are completely dust- and moisture-resistant gasketed enclosures. They are constructed of a fiberglass upper body and a high-impact acrylic/DR crepe pattern diffuser, securely positioned in a permanent, poured-in-place sealing gasket. The diffuser and upper components are locked by retaining latches, ensuring a secure, tight seal. At Diffuser Specialist, you can find many different sizes for vapor tights, as well as essential accessories. Additionally, our universal gasketed enclosure is designed to fully transform any strip light into a Vapor Tight fluorescent light diffuser. Flat Sheets – Our Flat sheet replacement fluorescent light covers are extruded acrylic or polycarbonate plastic. It is available in many different styles, thicknesses, and transparencies. Usually used for lay-in fixture and other lighting applications. Popular applications for flat sheets can be seen in schools, commercial buildings, hospitals, and hallways. Flat sheets are some of the most general fluorescent light covers. Diffuser specialist carries many versions and types of flat sheet. We can also custom produce flat sheet in sizes that are not commonly available. To order flat sheets from diffuser simply fill out the form below – if you don’t see what you’re looking for in our order form don’t hesitate to include special requests & instructions in the comments area below. Chances are we have it, and if we don’t – we’ll make it for you. Louvers – Designed to eliminate glare rendering more precise light distribution. This provides better contrast and image definition which enhances color rendition of merchandised products. If you wish to learn more, or are interested in ordering any of these fluorescent light covers, then you are encouraged to speak with a lighting specialist with Diffuser Specialist today.